In partnership with the City of Pittsburgh, an artist has been chosen to put art on the Elizabeth St. Bridge, facing the Elizabeth St. Park! Unveiling of the park and art will happen in July. More information will follow soon. In addition, Hazelwood artists Edith Abeyta and Dylan Rooke will lead a team to create 3 play stops along the trail as part of the Play Everywhere Challenge: Neighborhood Play Stop Project. And finally, a new sign will adorn the Lytle Street entrance to the KaBOOM! playground. Stay tuned to this page for updates as they come in! What is a play trail? A playful mind and body is a critical aspect in the lives of people of all ages. The Hazelwood Play Trail (HPT) will raise awareness regarding the benefits of play, while engaging the public with the neighborhood’s unique natural elements. The HPT is a currently developing project, promoting unconventional play-based learning and living in Hazelwood. It is a pathway of playful elements that raises awareness of the benefits and many different forms of play. The trail will allow for multi-generational public use, play advocacy events, community engagement activities, and educational purposes. It will create a space for people to gather and share ideas and to engage in new ways. The HPT is and will continue to integrate community involvement from all levels. It will change expectations on what play is or could be. It will provoke questions and conversations and allow users to view the same location within the community in a different light. To learn more about the Hazelwood Play Trail, take a look at our October 2017 HPT report, put together by Studio for Spatial Practice. what work is ongoing as part of the hpt? As part of the ongoing work on the HPT, the Playful Pittsburgh Collaborative applied for and received funding through the Play Everywhere Challenge in Allegheny County! The Neighborhood Play Stop Project will help to create more stops on the Hazelwood Play Trail. Thank you to KaBOOM! and Let’s Play. Read more about it here! Planting and boulder placement is complete at the Elizabeth Street Park! Behind the scenes work continues with coordinating art for the side of the Elizabeth Street Bridge and naming the KaBOOM! playground, complete with a new sign (coming Spring 2019). If you'd like specific information about the ongoing work, please email sarahs@tryingtogether.org with the subject Hazelwood Updates. Check out some photos of the existing work below (more photos coming soon)! The Hazelwood Play Trail Steering Committee first met on March 31, 2015. Individuals and organizations actively involved in Hazelwood offered feedback on what play meant to them. We obtained more valuable play feedback from the community when nearly 400 people attended the Ultimate Play Day 2015 and created a play web using pictures of their ideas of play. Following the Ultimate Play Day, the Carnegie Library of Hazelwood displayed the visioning exercise for neighbors to select images that represented their concept of play. In addition, the Student Conservation Association (SCA) worked through the summer of 2015 to share their vision for the Hazelwood Play Trail, specifically the Elizabeth Street Parklet. After all the vision exercises and feedback, the Hazelwood Play Trail is taking form. The project literally and figuratively connects already existing and newly created playful features in the greater Hazelwood community, and disseminates play throughout the neighborhood. A crown jewel for the neighborhood, the KaBOOM! Playspace was set to be built by 200 volunteers on Sept. 17, 2016 on Lytle Street. The playspace was funded by The Heinz Endowments, and organized by the greater Hazelwood community, the Hazelwood Initiative, Playful Pittsburgh Collaborative, Trying Together (formerly Pittsburgh Association for the Education of Young Children), and KaBOOM!. Just a stone's throw away, construction will soon begin on the Elizabeth Street Parklet. Play can happen anywhere, and under any circumstances. Rather than making play a "destination," we hope the Hazelwood Play Trail makes play part of the community's daily routine by providing "play-on-the-way" opportunities. 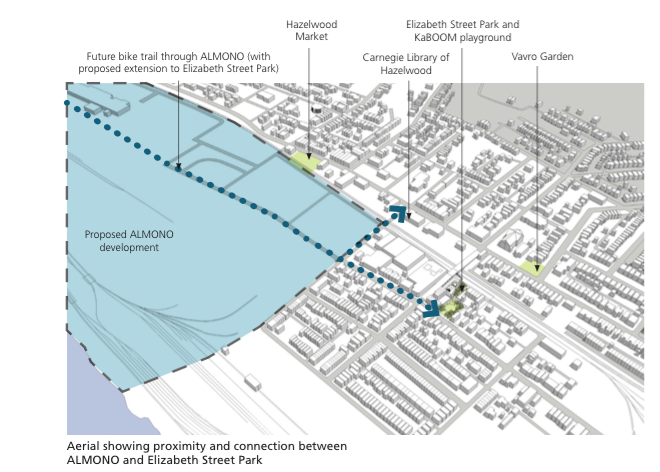 The next step in the process will be the Elizabeth Street Park (ESP), turning the current parking lot between Roma Way and Gloster at the Elizabeth St. bridge (behind the KaBOOM! playground lot) into a redesigned green space. Design drawings are pictured above. Community conversations will continue around marking the Play Trail and a final date for ESP ribbon cutting! 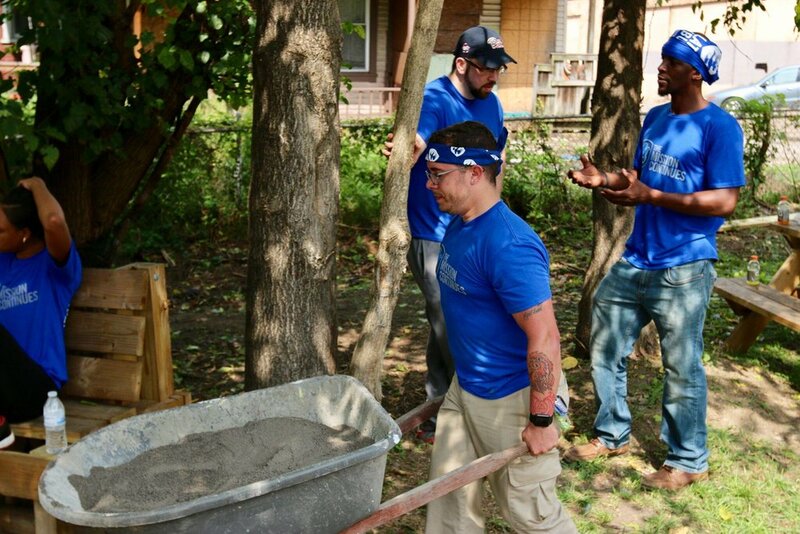 Check out photos from SOME volunteer days at the KaBOOM! site in September and October 2017! Thank you to the mission continues and pmadd for your help! View 1 of future KaBOOM! playground from Lytle St.
View 2 of future KaBOOM! playground from Lytle St.